Born in Rowan County on May 19, 1951, she was the daughter of the late Howard Glenn Kerr and the late Ruth Elizabeth Kennerly Kerr. 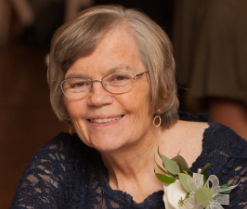 Sylvia was a graduate of North Rowan High School and worked in the business office of Catawba College and was a lifetime member of West Innes Church of Christ. Sylvia was preceded in death by her parents. Those left to cherish her memory are her daughter Jennifer Berkley and husband Andy of Salisbury, son, Chris Chandler and wife Kirsten of Taylorsville, sister, Glenda Barber and husband Glenn of Salisbury, grandchildren, Alex Chandler, Kaiya Chandler and Elijah Chandler, and nephew Michael Rymer and wife Jennifer of Salisbury. Visitation: 2:00-2:45 PM Sunday, April 7, 2019, at West Innes Church of Christ, 2975 West Innes Street, Salisbury, NC 28144. Service: 3:00 PM Sunday, April 7, 2019, at West Innes Church of Christ with Preacher Jeff Cannon officiating. Memorials: In lieu of flowers the family has ask for donations be made in Sylvia’s memory to Trellis Hospice, 101 Hospice Lane, Winston-Salem, NC 27103. Lyerly Funeral Home is serving the White family. Online condolences may be made at www.lyerlyfuneralhome.com.